Medicare Extra Help SEP - How to change your plan at ANY TIME? Posted on April 2, 2014 at 7:57 pm. How can you change your Medicare plan at ANY TIME using the Medicare Extra Help SEP? You may change your Medicare Advantage or Prescription Drug (Part D) plans ONLY at specified enrollment periods. The two most known of them are Initial Coverage Enrollment Period (ICEP) that occurs when you turn 65, and Open Enrollment Period that runs every year between October 15 and December 7. Outside of those periods, you can only change your health and prescription plan coverage, if you qualify for a Special Enrollment Period (SEP). Using SEP you may change a Medicare plan at any time or at specific times depending on the SEP’s nature. There are multiple reasons for SEP, such as losing employer’s health coverage, moving to another address, your Medicare plan does not renew its services, you wish to enroll in a five-star plan, etc. 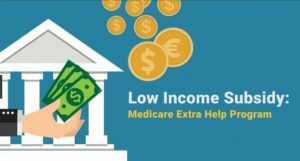 This post below describes SEPs associated with Federal and State programs helping pay the costs of Medicare Prescription Drug coverage: Federal Extra Help SEP and State Pharmaceutical Assistance Program (SPAP) SEP.
You may be entitled for Extra Help / Low-income Subsidy (LIS) Federal program that help pay the costs of Medicare Prescription Drug coverage (Part D). You may either apply for it (based on low income), or get it automatically if you have Medicaid, a Medicare Savings Program or Supplementary Security insurance. Having Extra Help, makes you qualified for SEP. You may join, disenroll from or switch Medicare Advantage Prescription Drug plans (MAPDs) or stand-alone Prescription Drug Plans (PDPs) beginning the month you become eligible for Extra Help. As long as you have Extra Help, you can switch MAPDs or PDPs once a quarter. You may be enrolled in one of qualified State Pharmaceutical Assistance Programs (SPAP). These programs help pay for prescription drugs based on financial need, age, or medical condition. The eligibility for those programs depend on program’s state and on the particular program. Most states have one or several SPAPs. For example, PACE and PACENET in Pennsylvania, PAAD in New Jersey, and SPDAP in Maryland. Having State Pharmaceutical Assistance Program, makes you qualified for SEP. You may join, disenroll from or switch Medicare Advantage Prescription Drug plans (MAPDs) or stand-alone Part D Plans once per year, at ANY time during the year. What do you think about Medicare Extra Help SEP: How to change your plan at ANY TIME? Write your comments. Liberty Medicare is a leading insurance agency that specializes in Medicare insurance in Delaware, Illinois, Maryland, New Jersey, New York, Ohio, Pennsylvania, and Virginia. All our services are absolutely free to you. An essential part of our job is working with low-income senior citizens and providing suggestions on available Medicare Extra Help Programs that will help with your Prescription Drug Costs. For help finding the best Medicare Advantage or Prescription Drug Plan for you, please contact Liberty Medicare or call us at 877-657-7477.